This map shows MCCT’s last area under construction by EBMUD. June 2nd, National Trails Days, is set to be an historic day! 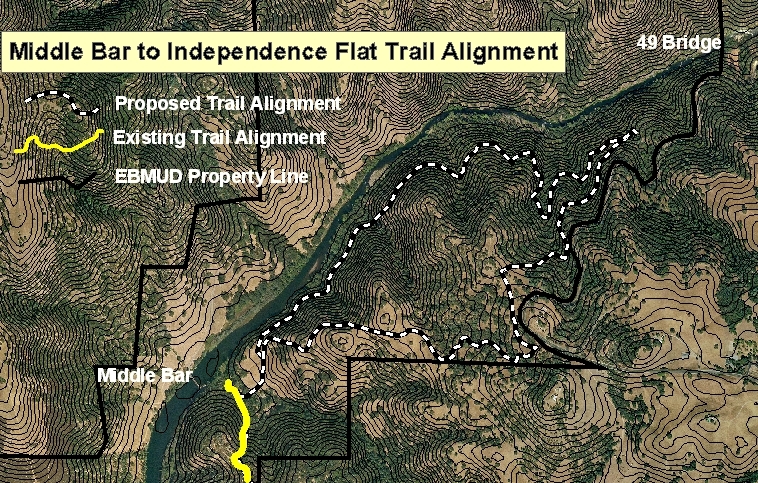 EBMUD estimates this trail’s construction will finally be completed. Conversion of ditch remains to trail tread started in August of 2011, relying on hand tools and hard work. On average, the crew completes 150 feet a day. The cross-country portion of trail is being built on 60% to 75% cross slope using a 1-ton mini excavator. With around 1,050 feet of the cross country portion complete, that leaves a balance of about 400 feet. Several gulch crossings were also developed.